Background: Full dental rehabilitation following segmental mandibulectomy or maxillectomy for oncologic tumor ablation should be the goal for every patient. But despite advances in technology and reconstructive techniques, many patients do not achieve timely or complete oral rehabilitation. Recognizing this fault, we recently adopted an innovative workflow (Figure 1) to increase the number of patients undergoing dental restoration, irrespective of tumor pathology or need for adjuvant radiotherapy. Methods: Preoperatively, every osseous jaw reconstruction undergoes virtual surgical planning to incorporate the placement of endosseous implants into the fibula osteocutaneous free flap. The dental implants are then placed intraoperatively at the time of tumor ablation and reconstruction. Four-to-six weeks following the initial surgery, the patient returns to the operating room for vestibuloplasty and exposure of the dental implants. Within 3 days of the vestibuloplasty, a temporary dental prosthesis is placed in the dental clinic, and the patient can then begin radiation therapy if needed. Following adjuvant radiation therapy, the temporary prosthesis can be replaced with a permanent one. Results: Immediate dental implants were placed in 23 patients between June 2017 – May 2018. Average number of implants placed per patient was 2.6 (range 1 – 5 implants). Thirteen patients underwent postoperative radiotherapy. There have been no implant failures. Average time to final prosthesis placement was 61.7 days (n = 10). 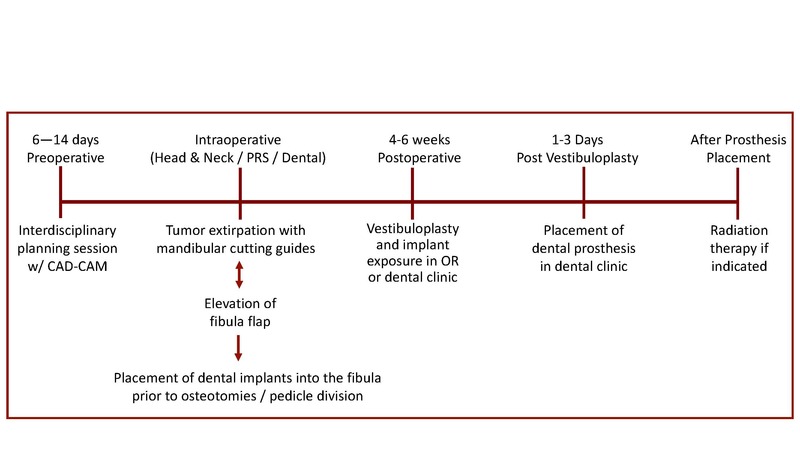 Conclusion: At our institution, this innovative workflow has allowed for earlier aesthetic restoration of the jaw and greatly expanded the number of patients able to achieve oral rehabilitation following oncologic tumor ablation. Figure 1. Workflow for dental rehabilitation in oncologic osseous jaw reconstruction. [CAD-CAM = Computer aided design and computer aided modeling; PRS = Plastic & reconstructive surgery].